I just pitched a story on one of my favorite Tumblrs, Things Organized Neatly, but Rob Walker, in a lovely final Consumed column in the New York Times Magazine, beat me to it. His theory of TON's appeal is that looking at organized stuff allows us the vicarious pleasure of ownership — without the storage and consumer guilt. I thought that was the purpose of failed EBay bids (I am usually glad, in the end, that I didn't win) and the proliferating social shopping sites: Polyvore, Svpply, and so on. So maybe all the eye candy, none of the bills, is the mode of the moment. Since Walker's new projects (sign up for his newsletter here) include the Tumblr Unconsumption, he's obviously betting on reduce-reuse-recycle. Things Organized Neatly is images of just what it sounds like. But within that rubric, an amazing number of different things: desks, ingredients, bookshelves, etc. I realize I like it so much because it continues the essence of the modernist project, organizing people and their things into grids, but digitally. I think of mid-c precurors like George Nelson's StorageWall and the Eames 3D exhibition murals, and contemporaries like the grid organization of Etsy's Treasury feature and the Cargo theme on Tumblr. Once I started thinking of historical examples of Things Organized Neatly, more came to mind. 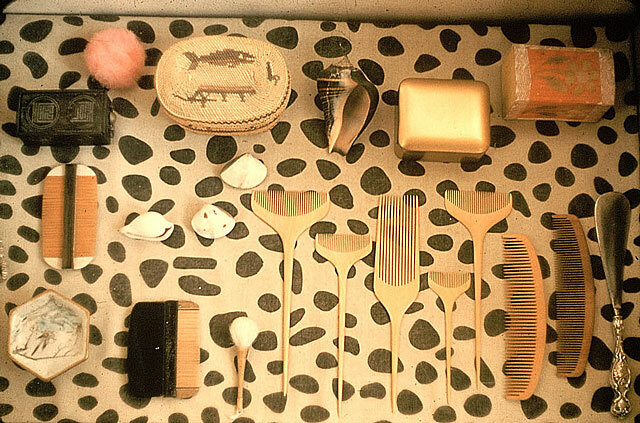 The "shelfscapes" of dolls and combs and and other small-t treasures at the Eames House. Alexander Girard's wall of textured storage in this Palo Alto house. Punch cards. The square-footage hierarchies of the modular postwar office building. There's a dark side to all of this, the organization of bodies via modernist method during World War II, but the postwar examples are a way of dealing, as we are today, with plenty. Watching the new documentary, The Visual Language of Herbert Matter, only reinforced my idea of TON as a continuation of the 20th century design project. Matter's work, particular his postwar work for Conde Nast and Knoll Inc. organized things neatly over and over again. The Bertoia chairs become fabric swatches, the fabric swatches a pinwheel. Or one sees the knives and forks and plates (in the film, I couldn't find an image online except for these paintbrushes) as a sort of troop movement across the table. A grid is always latent. The hangover from Matter's early photocollage work (Switzerland, snow, skis, diagonals) is in the layering of those grids to create shallow depth. Obvious in the painters cover above, less so in the Bertoia chair ad where text, upholstery and wire chair all float on separate-but-aligned planes. All the submissions on TON could use Matter's masterful alignment as a guide. As Conde Nast archivist Shawn Waldron says in the doc, he made "these precision-filled still lives with all sharp angles... When I think of Herbert I think of him up on a ladder in the studio. Look at this: shot from above, equal lighting all around, and every angle is absolutely perfect. You can almost see him out there with a T square making sure everything is absolutely right." The documentary is screening this spring (dates available here; next U.S. shows in Richmond TONIGHT and Pasadena 3/31) and will be available on DVD in the fall. Clips here. 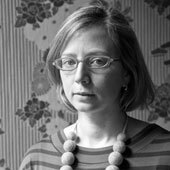 One can also see more of Matter's work online in the Conde Nast and Stanford archives. Jessica Helfand wrote about his (very neat) identity for the New Haven Railroad here, her experience with Matter as teacher here, and also appears in the film.